So, no Open House. Wah. That’s great, because God–Who always makes A Way, where there seems to be No Way–has provided another opportunity for you to be on-campus at our regal Queen of Race Courses the weekend prior to Opening Day! And, lest you think that your senses of taste and touch will miss out on this one-of-a-kind experieince, fear not, for you are cordially invited to Breakfast on the Porch–where you’ll taste yummy Continental Breakfast victuals and strong coffee. Your sense of touch will be stimulated as you shake hands with your hosts, Chaplain Humberto Chavez; Saratoga Springs’ own Mayor, the Honorable Joanne Yepsen and renowned Trainer, Nick Zito. Yes, folks, you are invited to join the Race Track Chaplaincy of America–New York Division–for the first of their three events during the Saratoga meet. This Saturday–JULY 18–at 8AM, the aforementioned hosts and guests will greet you on the world’s most beautiful Clubhouse Porch at Saratoga Race Course, to break bread (Continental Breakfast), drink pots of good, strong coffee; discuss the coming race meet and to hear about all the wonderful reasons why you should love and support the Chaplaincy. And you should. Every year, the Chaplaincy works to bless and enhance the lives and souls of thousands of good people who work at America’s race tracks. 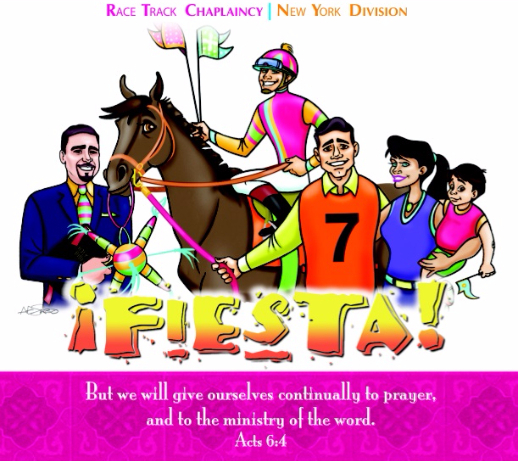 Our New York NYRA tracks–Saratoga, Belmont and Aqueduct–all are served by the New York Division: Chaplain Humberto, his wonderful wife, Karen Chavez and scores of volunteers and donors. If your only excuse for not attending the Continental Breakfast this Saturday is that you’re “…not a ‘religious’ person…”–forget it. You don’t have to be a “religious” person–but you do have to respect those whose relationships with the Almighty have led them to serve others, selflessly, 24/7/365. Let’s see: you love horse racing. You eat food. You’d go out to McDonald’s or Dunkin’s on a Saturday morning, anyway. May as well drop that same thirty bucks on a Breakfast with Benefits: eat–chat–watch horses work out–be blessed. The odds of you, having a friendly conversation with Nick Zito while standing in line at McDonald’s? On the Clubhouse Porch, helping to raise funds and awareness for the Chaplaincy? 100%. NOTA BENE: You can get more info and RSVP for all three events by contacting the Chaplaincy via the email address and phone number, above. 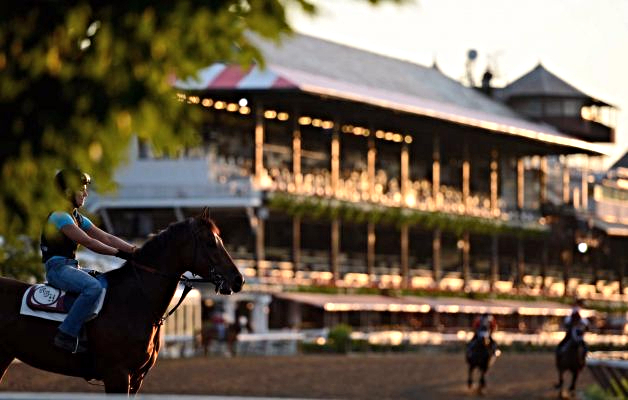 Please join RTCA-NY and Saratoga Springs’ Mayor, the Honorable Joanne Yepsen, for a continental breakfast on The Porch of Saratoga Race Course on Saturday July 18th at 8am. 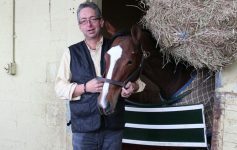 Meet multiple Grade 1 Stakes winning trainer Nick Zito during morning training as we learn about the NY Race Track Chaplaincy Summer Programs. Every year people of all ages come out to watch the rivalry between these two teams. Come watch them duke it out on the court–a game you won’t want to miss. 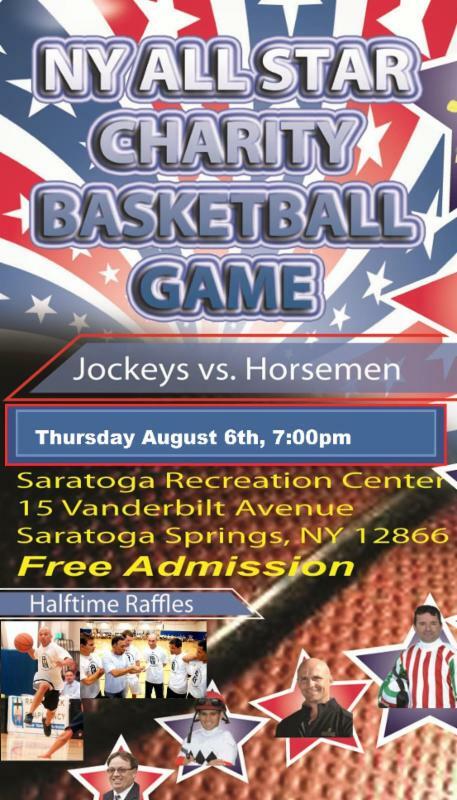 The game will be held Thursday, August 6th, at 7:00pm at the Saratoga Rec Center, located on 15 Vanderbilt Ave, Saratoga Springs, New York. 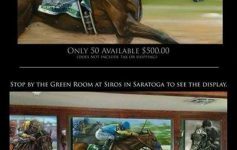 This year the celebrity showcase is guaranteed to draw a crowd when some of the biggest names in horse racing hang up their whips, conditioning books, and go head-to-head for a great cause. Family and racing enthusiasts will have the opportunity to experience a competitive charity basketball game; celebrity autograph signings; photo-opps and much more. Come have a great time with friends on Wednesday, August 19th at 11am, at Saratoga National Golf Course. (458 Union Avenue, Saratoga Springs, New York.) 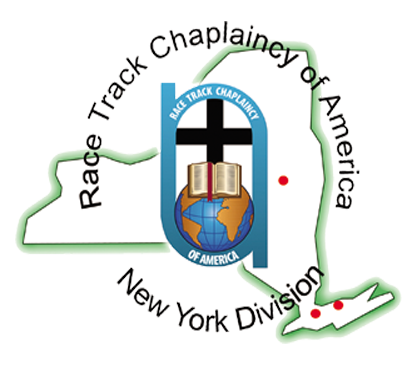 Learn more about the year-around work of the NY Race Track Chaplaincy. 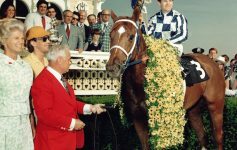 This year we will honor Trainers David and Fay Donk. Tom Durkin, legendary track announcer, will be the Master of Ceremonies. Donations from all events will be used to provide assistance where it is needed, and to supply all the year-around programs at Aqueduct, Belmont and Saratoga. We promise to honor your generosity and use your donation in the most effective way possible. Previous Article Fashionable Fillies Luncheon 2015: Great Women, Great Food, Causes Worth Your Emotional Investment. Next Article A Happy Convergence: Brian Fox, American Pharoah, Saratoga–and YOU.